Fed - To Call or to Put? It was only a few weeks ago markets priced a cut by the Fed, while the markets now are pricing a small hike in December. It looks like the Trump call, replaced by the Powell put now has been replaced by a call for the Fed to rise rates should all go back to “normal”. Markets have rebounded violently, volatility is down again and credit markets are easing up. The below chart shows the SPX (orange) and the Fed rate expectations (white). It seems these days everybody is looking at the SPX intra day chart, including the Fed. The question is when does the bounce become a barometer of the great economy and the Fed needs to call that hike trade again? The moves are so violent, even more to the upside than the downside, so we continue to love gamma. VIX has come off massively over past weeks, but we are getting even more interested in long plays on the Eurostoxx 50 volatility, V2X. Europe is still a huge mess. Note the V2X versus VIX ratio as of late. As the SPX has been rebounding, the US 5 yr 5 yr breakeven rate has joined the spike move higher. 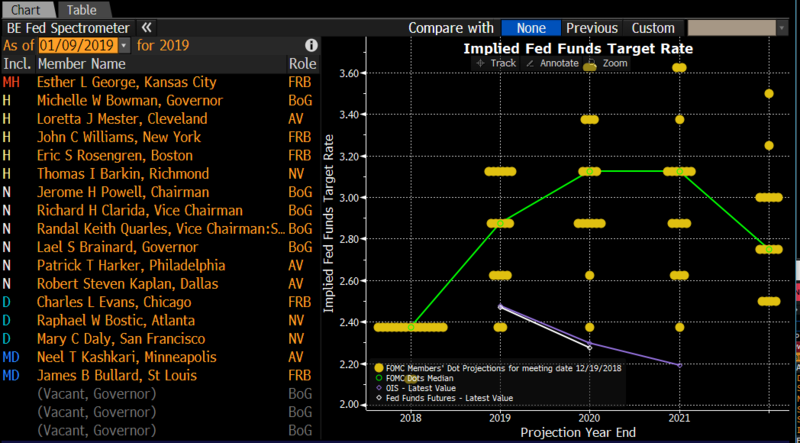 Given the fact the Fed’s “natural” preference here is to continue hiking (see the Dot Plot below) we would start looking actively for long convexity trades here.